It feels strange and exciting and a little bit terrifying. 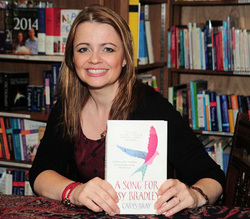 A Song for Issy Bradley unfolds through the points of view of each member of the Bradley family. Which character did you find easiest to write and which is your favourite? It was fun writing a narrative that kaleidoscopes between the members of the Bradley family. If I was struggling with one perspective I could always take a break and work on another. I found seven year old Jacob Bradley the easiest to write, perhaps because I’ve spent a long time surrounded by children’s voices. I think Alma Bradley, the teenage son, might be my favourite. He’s awkward and cynical and in a way he’s the ‘villain’ of the family, but he’s actually a good lad and I enjoyed writing his chapters. A Song for Issy Bradley portrays the way in which the rituals and teachings of the Mormon church shape how the family responds to a bereavement. Has the novel had a different reception inside versus outside the faith community? So far the Mormons who have read it seem to like it (although my dad said he thought there was too much swearing!). As I was writing it I was thinking about an essay by Salman Rushdie in which he writes, ‘The most secular of authors ought to be capable of presenting a sympathetic portrait of a devout believer.’ I hope I’ve managed to do that. The novel draws on some of your own experiences, including growing up as a member of the Mormon church and the death of a child. What particular challenges did this bring to the writing? My second child was born with a life-limiting condition and she died when she was a baby. Issy Bradley dies in very different circumstances, but I do think that my experience of losing a child made me interested in grief and the different ways it effects people. I’m also really interested in faith and doubt and the mechanics of miracles, so it seemed like a good idea to set the novel in a religious family. Of course, I could have researched a different religion but, perhaps a little lazily, I decided to make use of the religion in which I grew up. I don’t think there were any particular challenges in the writing of the novel. My main worry was that people would assume it was autobiographical and it was partly in an attempt to counter that assumption that I chose to write it from five very different perspectives. One of the discussions I’ve been having with my blog readers is how some writers feel a stronger affinity to memoir and others to fiction. Did you ever consider sharing your story as a memoir? I’m not sure that my life is interesting enough to write about! Although my own story involves the death of a child, it’s is very different from the story in A Song for Issy Bradley – for starters, my own story involves leaving Mormonism, and that isn’t something I’m especially interested in writing about. I loved how you wound the different threads together in a conclusion that was believable, poignant and satisfyingly ambiguous. How soon in your writing process did this ending come to mind? I knew from the outset that I wanted the novel to begin and end on the beach. Originally, the ending was slightly more ambiguous, but I think people found it frustrating so I tightened it up. I finished editing the novel in August 2013. My agent sent it off to several publishers and I believed it would be up to three months before I heard anything, so I put it out of my mind. However, two days later I had a phone call to say that there had been an offer for the book. By the end of the following week I had a publisher. It was tremendously exciting – probably the most exciting week of my life. I do both, I think. I always knew how the novel would begin and end, but there were bits in the middle that weren’t really planned and were consequently a result of either instinct or accident (or a combination of the two, perhaps). I write at a treadmill desk which probably counts as a writing quirk! Don’t edit as you go – it’s not that this is bad advice per se, it’s just that I can’t do it. I have to edit as I write. I’m not entirely sure. Perhaps it’s the same thing that keeps me going in general - the hope that things will come right in the end. I’m just finishing off my PhD and beginning a second novel. 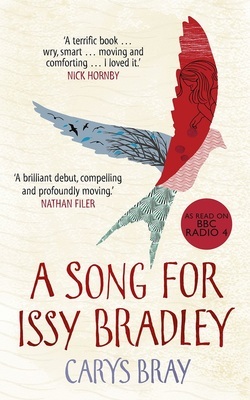 I don’t think so, but maybe I can, somewhat cheekily, use this opportunity to let you know that A Song for Issy Bradley will be the Book at Bedtime on Radio 4, beginning 11th August.